Addiewell Free Church, next to the Public School. The old UF Church - the tin church - can be seen in the 'Square' west of Graham Street. The parish church (Church of Scotland) can be seen on the extreme left. 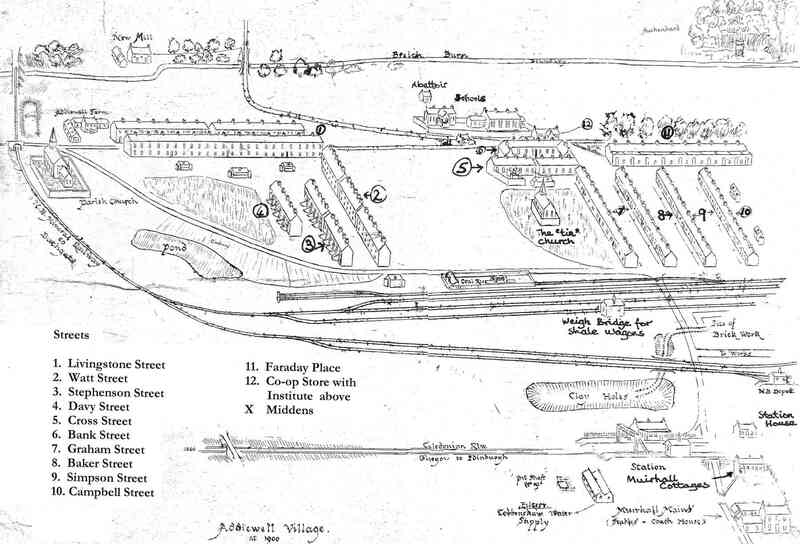 The later UF Church beside the schools had not yet been built at the time of this 1901 sketch. The Established Church or Church of Scotland church, built in 18xx. Now a private house. Addiewell had three Protestant churches by 1900. The earliest was the Free Church, which held services in the Institute hall, then in 1874 opened a 'tin church' - made of pre-fabricated corrugated iron sheets -behind Graham Street and Cross Street. This church was a gift to the Free Church mission in Addiewell from the Barclay Free Church in Edinburgh. Next to be built was the Church of Scotland (or Established Church) built in Livingstone Street c. 1884. Then the Free Church built a brick church immediately west of the schools. The old tin church became for a time the United Presbyterian (UP) Church. In 1901, the Free Church and UP Church united nationally as the United Free (UF) Church. In Addiewell, the UF congregation worshipped in the tin church building behind Graham Street. The Free Church beside the schools became a private house, but has been demolished. In 1929, the UF Church and the Church of Scotland united nationally. 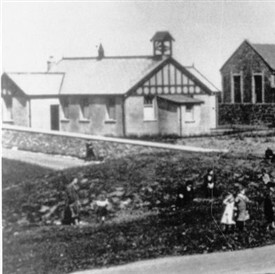 The two congregations in Addiewell united, and worshipped in the Livingstone Street church. The old tin church was sold and the material was used for the erection of a picture house at Stoneyburn. In the 1990s, Addiewell church united with the congregations of Longridge, Breich and Stoneyburn to form the Breich Valley Church. A new church building opened in Bents in 2005. Addiewell Church was sold and has become a private house. Based on an article on the history of Addiewell by "Breich Mill", in the Midlothian Advertiser, 6 Jan 1950, page 6. NEW FREE CHURCH AT ADDIEWELL. 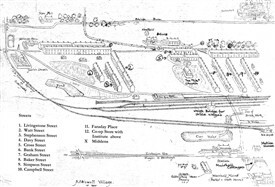 – A neat and commodious iron church, capable of holding 300 persons, which has just been erected at Addiewell, was opened on Tuesday last by the Rev. J.H. Wilson, of the Barclay Church, Edinburgh. The church is a gift to the miners’ mission by the congregation of Barclay Church. The great change and increase that have taken place on the village of West Calder during the past twenty years are due to the paraffin oil industry, as no other local industry has been introduced; and, if the prosperity of any place is in any way measured by the increase of the places of worship, it may be said that few places have been so prosperous as West Calder; as within the last ten years, it has been found necessary to build new churches – for the United Presbyterian with 700 sittings, the Established church with 600 sittings, and the Free Church with 500 sittings A chapel has also been built by the Roman Catholics with 500 sittings. These are all handsome and commodious structure which add much to the appearance of the village. Extract from: A History of West Calder: compiled from various sources of information, by ‘A Native’ (i.e. the Rev. William C. Learmonth), West Calder, 1885.